This FAQ section answers common questions about our company. If you do not see the answer to a specific question then please, Contact us and we will get back to you right away. IADDIC provides the construction equipment, tools, and materials needed to build high quality, durable, and affordable SIP Panels for building structures across the globe. We have a scalable suite of SIP Panel manufacturing systems to meet just about anyone’s building envelope needs from shelters to houses and commercial buildings. What can I build using IADDIC? The suite of Construction Materials, Construction Tools, and Construction Equipment makes it possible to build almost anything. The first requirement, of course, is to let us help you determine what is needed for your project. Please submit a request for quote. We have engineered our systems to be used just about anywhere in the world. International construction is hampered by the limited availability of quality construction materials and too often people try to import finished goods or pre-fabricated products. We believe improving the quality of international construction (especially housing) demands code compliant materials and processes that leverage as much of the local content as possible. How do I know what construction system is best for my application? If you have any questions at all, please do not hesitate to contact us. We will do our best to help guide you in the selection process. Do you have an environmental impact statement? Are there any videos pertaining to the shelters? Yes, you can see the PBS3000 in action here. Is there any information about insulation resistance? Structural foam and composites have been used in the construction industry for years, though most commonly seen in panel form, or structural insulated panels. The average R-value for polyurethane foam is R 6.5. The “R” value of the finished buildings can be between R-18 and R-30 and higher depending on the desired thickness of the panel. Notably higher than most homes in the USA. Who does IADDIC sell to? IADDIC sells to businesses and organizations engaged in the construction of structures both domestically and internationally. We sell to contractors working anywhere in the world who are engaged in commercial construction, residential construction and even the mission-minded organization building small houses and disaster relief shelters. You can also learn more about SIP Panel Housing. When will the Global Mobile Factories be available for Purchase? Global Mobile Factories are available for custom design work at any time. The factories are not stock items and must be designed and manufactured per the customers specification. This FAQ section answers general questions about SIP Panels. If you do not see the answer to a specific question then please, Contact us and we will get back to you right away. Why is IADDIC providing SIP Panel Building Systems? We really dislike knowing one of the best building systems, SIP Panels, are not available to most builders; domestically or around the world and we believe we can help improve construction in areas where traditional construction cannot keep up with demand. SIP Panels have been in use in the US since the 1950’s and are the most economical construction system to build with. The problem is that most manufacturers can only service local or regional areas making SIP Panels unavailable for most of the world. And even if they shipped panels for building internationally, the costs of shipping them pretty much wipes out all cost savings from using them. Also, there is no denying that the combined savings of using local labor, competitive material costs, and the most efficient shipping of ANY raw material used in construction gives the builder the only truly affordable housing construction system and unbeatable cost advantage. SIP Panels, otherwise known as Structural Insulated Panels are typically two outer layers of structural sheathing material separated by an insulated core. What do SIP Panels Replace? Structural Insulated Panels replace the most common wall and roof systems that make up the building envelope. Including the standard stud/insulation/sheathing wall system. Panels can be manufactured to be “complete” in that they include skins that serve as the interior and exterior surfaces. This is particularly true if you are using MgO. Many have used sheathing such as OSB for outside facings and drywall for interior facings. However, these materials require additional protection to shield them from the elements (rain and moisture) and use. What makes up a SIP Panel? 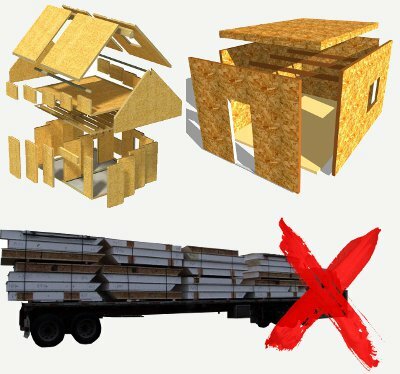 SIP Panels are made up of an outer and inner sheet of structural material like plywood, OSB, or Magnesium Oxide (MgO) and an inner core of structural foam. Structural insulated panels are manufactured with one of three types of cores: molded expanded polystyrene (MEPS), extruded polystyrene (XEPS), and urethane (polyurethane and polyisocyanurate are types of urethane). IADDIC has chosen polyurethane structural foam because they are most environmentally friendly and have typically higher insulation values. Polyurethane Structural Foam is also Highly Condensed: Polyurethane Structural Foam expands between 20 – 40 times when used in the panels. This means nothing ships more efficiently. Also, Structural Insulated Panels are 100% bonded together by the foam. Unlike using EPS, which needs gluing between the skin and the core, polyurethane foams “into” the skins creating a bond across the entire surface so adhesion is guaranteed. What is the foam core made of? After years of research and development, IADDIC has settled on a polyurethane structural foam we call SIH because polyurethane offers the best opportunity to build economically and quickly while being tough AND environmentally safe. How environmentally safe is foam? There are many types of foam and many of them have negative side effects on the environment. IADDIC’s foam has been made using blowing agents that are zero ozone depleting and emit no greenhouse gasses. In short, IADDIC materials are environmentally safe and nonhazardous; SIH also complies with the Kyoto accord and protocols (regarding greenhouse gas emissions- GHG), as well as the Montreal protocol (non-ozone depleting). Normal safety measures are always needed when performing construction activities. We sure do! Our Environmental Impact statement is available here. Are the SIP Panel materials you sell flame resistant? IADDIC SIH is rated at Class B fire rating. The MgO skins have a flame spread of zero (the highest protection rating and are tested to ASTM E162. The flame spread rating of a material is determined by subjecting material placed in a horizontal tunnel to a gas flame (Figure 2). A combustible material will be rated as Class A, Class B, or Class C based on its performance in this test. A material rated as Class A would have a lower flame spread, and therefore a better performance rating than a Class C material. The results of the flame spread test results in a numeric rating. If the numeric value is less than 25, then a Class A flame spread index is assigned. Numeric values for Class B are between 25 and 75. Values above 75 fall into the Class C category. Most commercial wood species have a flame spread index between 90 and 160 (Forest Products Laboratory, 1999). What Sizes are SIP Panels? How do SIP Panels fit together during construction? What is the best way to seal a SIP Panel joint? Use caulk and caulking guns to seal the seams. What is the best way to cut a SIP Panel? An over-sized circular saw is useful for cutting thinner SIP Panels. Larger SIP Panels are cut most effectively with a circular saw fitted with a chain saw blade. See our Construction Tools page for more information. Do I need to protect the Panels before Use? While storing structural insulated panels, protect them from damage by keeping them covered. It is best to keep them dry as OSB and other wood products will swell and will need to dry out before use. Does there need to be an expansion joint? Do I do anything special when installing windows and doors? When creating openings (i.e. windows), the foam should be notched to allow for a framing member. This slot can be made using the IADDIC edge router. Once notched, insert a framing member into the notch. Wiring and plumbing chases are typically installed while you are making the panels. However, chases can be drilled or routed into the panel afterward. We offer a conduit chase drill for this purpose. Can SIP Panels be used below Grade? SIP Panels constructed from MgO cement board skins are perfect for long-lasting below grade applications. Wood skinned products do not do as well below grade as the wood rots. Can MGO panels be manufactured in other sizes? Yes, you can customize panel sizes: Length, Width, and Thickness before the panels are made. Panels can also be cut into virtually any shape after the panel is made. Can MGO panels be used as a floor? Yes, MGO SIP panels can be used in a flooring system quite easily on the on-grade floor and applied over a structural joist system for upper floors. Care must be taken to ensure the floor joist system can support anticipated loads. Absolutely! MGO SIP Panels have a number of benefits that make them suitable for roof application: They are water resistant and have high load strength. They can be used to create roofs that are flat or pitched. What is the roof load rating? Typically the dead load is about Ten (10) pounds per square foot and live loads are relative to Geographic conditions and are determined by location. Can MGO SIP panels be used as interior walls? Yes: The whole point behind the IADDIC system is to give you the flexibility to complete the building envelope and the interior wall system. Because of this, you do not need to acquire additional materials or hire other framing tradesmen. Plus, using the structural insulated panels on interior walls provides increased fire protection, increased thermal mass, and in some situations improved noise reduction. They make great load-bearing walls. A thermal bridge is anything that transmits thermal convection from one side of the panel to the other. The joints are the most susceptible to thermal bridging because solid wood or steel are commonly used to connect the panels. However, by using a thinner SIP Panel cut into strips and used as splices reduce or eliminate the thermal bridge. This strategy is normally used in the Net-Zero and passive house systems. What is R-Value of a SIP? The R-Value of a SIP using the SIH polyurethane structural foam is approximately R6.5 per inch. Plus the MgO skins offer and additional .5R. So nominal SIP Panels with 3-1/2” thick cores and ¼” to ½” MgO skins will be about R23.75 (24). A measure of the resistance of an insulating or building material to heat flow, expressed as R-11, R-20, and so on; the higher the number, the greater the resistance to heat flow. Why Does IADDIC recommend MgO? There are three important reasons: R-Value! MGO skin and polyurethane foam core have very high thermal insulating values. MGO cement boards are fire resistant. It will not burn even when a 1000C torch flame is applied to the MgO cement board for 45 minutes. MgO will not rot and resists molds. When combined with the properties of closed cell polyurethane structural foam they create panels that are almost impervious. Are there different grades of MgO cement boards? Yes. Not all MgO cement boards are created equal. There are essentially three grades with which to chose. 1. International Code Compliant boards are manufactured in the USA. They have building code ratings and have certifications regarding those tests. 2. A Non-certified – Quality Controlled board inspected by US Quality Inspectors is available from China. 3. A non code compliant, non-quality controlled board is available out of China. Can MGO panels be built to comply with different building code requirements? MGO panels have been produced for a wide variety of building requirements. We will work with you and the local building authority to confirm codes and building requirements are met. Does water affect MGO panels? Yes and No. The MgO Panel will not break down and disintegrate in water like gypsum, so it is perfect for applications that may get wet. However; MGO products are known for corrosive effects on fasteners caused by the Magnesium Chloride (MgCl2) which is used to manufacture the MgO cement panels. The MgCL2 may corrode untreated metal fasteners. We recommend coated or stainless steel fasteners. SIP panels have been used in construction in the US since the 1950’s and were invented in the 1930’s.